I did this design after getting a new computer. After buying the processor, monitor, and printer, I wasn't willing to spring for a set of speakers too. After going "soundless", I decided to add speakers. Of course, this was the perfect excuse warm up the soldering iron to try out a new design. This original design is a variation on a well-known design, examples of which can be found in a great many texts. My variation was to add a second differential stage to replace the usual common emitter-plus-constant current source. Doing so opens up a second inverse feedback path. The signal path being a series connection of the differential amp inverting inputs, and the feedback being the non-inverting inputs. To this end, the constant current source does not include bypass capacitors to render it a DC-only stage. The other feedback path is the usual one: output to the non-inverting input of the first differential stage. The idea is to add lots of inverse feedback in order to linearize the output transistors, as the non-linearity of these devices makes them rather poor analog amplifiers. The other design criterion was the use of components readily available at a hobbist's store: "Radio Shack". No "exotic" components that would require a special order are used here. To this end, the output stage is a semi-complementary design, although this is not optimum so far as fidelity is concerned. (Radio Shack doesn't offer complimentary pairs of power BJTs.) Since the amp is intended to work into the "wide band" (60Hz -- 18KHz) speakers that this store sells, the gain is deliberately kept down. With the design given here, the max output is 6.0W. Even here, since these speakers are rated at 3.0W, you could blow speakers if the volume is turned up too high. 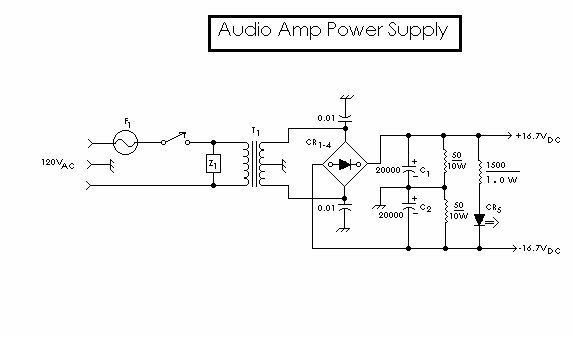 Limiting output is accomplished with the initial voltage amp (Q1). This stage has a gain of 7.5, so that with a 1.0VRMS input, the output voltage becomes slightly less than 7.5VRMS. 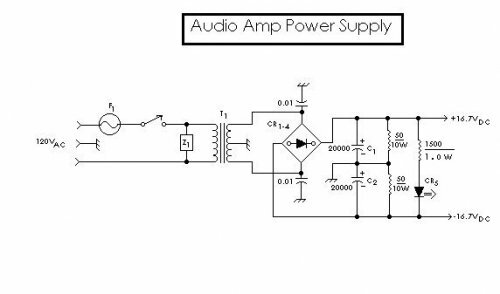 The gain of the circuit from the output end of the volume control to the speaker is unity, due to the large negative feedback. You could drive the power output as high as 10W, as there is plenty of "head room" in the power supply design. (Again, this was done to improve the fidelity as much as possible with a BJT-based design.) If you push the output, you will need better heat sinking on the finals than what's described here. The selection of actual components is not critical. Any small signal "transistors anonymous" will work here. The only exception is Q8 and Q10. These two must be a 2N3904 and a 2N3906, as these are complimentary pairs. These transistors set the characteristics for the entire final, and must be balanced as to characteristics in order to keep DC out of the speakers, and for symmetrical amplification. As for the differential pairs (Q2, Q3, Q5, Q6) type isn't so important, however, matched pairs is important. It's a good idea to get a couple dozen of each, PNP and NPN, and select pairs that match closely in VBE and hFE. Matching pairs in the differential stages helps hold down DC offset, as this design uses DC coupling in the interest of good low frequency response. Speakers tend to object to any significant amount of DC by burning out the voice coils. It also compromises fidelity in that DC on the voice coils restricts the movement of the cone. The 1800pF capacitor connected to the drain of Q1 was included since one of these amps showed a weak (10mVP-P) oscillation at 700KHz. If you include it, be certain to make the connection with the least possible lead length, as it is an RF component. It will have no effect on the audio quality since its cutoff frequency is about 58KHz. The entire unit is designed to fit in a plastic "project box" cabinet of 7 X 6 X 3 inches. The "wide band" speakers are 3� inches in diameter, and fit in a cutout of 37/16 inches. The circuit board is: 6� X 2� double-sided, copper clad. The circuit is built "dead bug" style, simply by making all ground connections by soldering to the unetched copper, the rest of the wiring being made above the circuit board. If additional mechanical reinforcement is needed, this is provided by soldering 2.2MEG resistors to the copper ground plane for use as a "tie point". Connecting such large resistors between the circuit and ground doesn't affect the operation since the impedance at that point is going to be several orders in magnitude smaller. To fit the circuit on the board, both sides are used. The preamp module being constructed on one side, with the final being built on the opposite side. The heat sink for the power transistors is made from two pieces of steel or aluminum 1 X 1 (in.) angle stock. Simply measure off a 2� length, and cut it in half. This will naturally provide the necesary gap to separate these heat sinks electrically. Sand off enough copper from one end of the circuit board to insure that the heat sinks aren't being shorted out. These are attached to the circuit board with one screw and nut. (Also, be sure to clear the copper away from the screw heads on the preamp side of the circuit board, otherwise, you will short out the finals.) In the middle of one flange of the angle stock, bore a hole slightly smaller than the diameter of the 2N3053s. This hole should be enlarged by careful reaming, so that the transistors fit snugly. This is essential for good heat transfer out of the transistor and into the heat sink. Once this has been done, give the transistor a thin coat of silicone heat sink grease and press into place. These can be set aside until you need them. Once the circuit is completed, and you've checked for wiring errors, the initial test is done with a 10 ohm/10W resistor connected to the output in place of the speaker. It is essential that this circuit, at no time, ever be run with no load. The Q3 DC return is solely through the load. If there is no load, this differential stage becomes severely unbalanced, and that will propagate to the finals, and probably blow one or both finals. The first thing to check is the DC voltage across the 10 ohm dummy load. This should be less than 0.5VDC. If there is more DC than that, then check each differential stage to see where that DC offset is coming from. This is most likely due to mismatched transistors (you did select for balance didn't you?) or finals too far out of match. When I did this construction, I didn't bother matching 2N3053s as the characteristics of the finals are determined largely by their Darlington counter parts. I didn't have any trouble from these components, but you can't rule the possibility out either. If the DC balance is acceptable, then you can either test with the dummy load, a signal generator, and an oscilloscope. You should see a faithful reproduction of the input wave form. If all goes well, then you can connect the speaker. When making this connection, it's a very good idea to connect the speaker return to the same point where the connection to the DC ground is made. This prevents the possibility of setting up an audio frequency ground loop. This, in turn, can cause instability that's next to impossible to fix. That means do not try to "one wire" the speaker if you decided to build the amp in a metal project box. Adjust the bias for 10 -- 15mA of no-signal idling current. You should then be good to go. The power supply is simply a straight forward symmetrical plus/minus supply constructed from a transformer with a balanced secondary and a bridge rectifier module. Even though the transformer was a self-wound unit, any transformer with a 25.2VCT secondary at 2.0A will be a good substitute. Such transformers oughht to be available as VT "heater transformers" for high power "ham" RF amplifiers. It is essential that the primary side of the transformer be connected exactly as shown. This PS uses a MOV for over voltage protection. These things have a nasty habit of not turning off once they turn on. The fuse needs to be connected between this MOV and the mains. Don't attempt to "go cheap (or lazy)" and fail to include it. A 2.0A, "slow blow" type works well here. It will stand up to the initial surge as the filter capacitors charge up, and will prevent damage or worse should the MOV be triggered. This supply is somewhat over rated for the application, and is heavily bled for good voltage regulation. There is still some 120Hz hum that could be eliminated with a more involved PS circuit. However, as this wasn't intended as a "premium" amp, that wasn't necessary. The hum is most noticeable when running with no input signal. While actually playing sound, it's no longer noticeable. If you want to substitute a better supply, then that's OK, too. R< sub>: 1.0K/�W miniature pot.